The ride of your life - cycle six passes amidst the breathtaking Indian Himalaya! 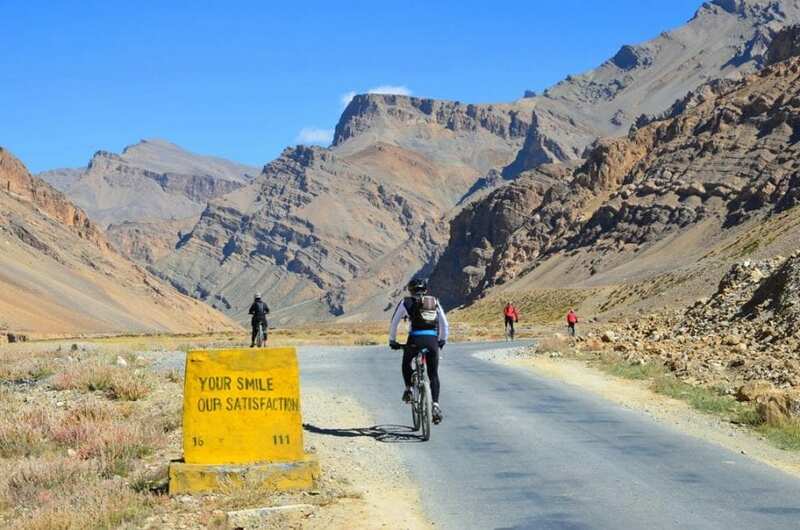 If you’re a cyclist, you’ve heard about (and probably dreamt about) the Manali to Leh ride. For many, it’s the ride of a lifetime. Join up, and you’ll cycle six high passes amidst the breathtaking Indian Himalayas. The region is well-known for Tibetan Buddhism and epic vistas. The route weaves across the Himalayas and provides a taste of Ladakhi culture. Despite the challenge, this is tranquil and stunning region of largely untouched land. In addition to incredible cycling, you’ll explore Delhi, Chandigarh, Manali, Tsokar Lake, and Leh. The flight back from Leh to Delhi will surely rank among your most memorable as you have an unparalleled view of the Himalayas from that vantage. Running the trip in this particular direction means there will be more overall climbing, but it also provides the best opportunities for acclimatisation. This is a road trip, but not all the roads are in great condition – so be prepared for some rough stretches. There is little technical riding despite crossing six high passes. Some of the riding will be at an altitude of over 5000 metres. All of this is to say that you should have some previous experience and a high level of fitness in order to get the most out of this trip. Enquire today to learn more. Hello! If you’d like to chat about finding you the perfect adventure or guidance on what’d suit you then we’re very happy to help. Tori & Larissa 0207 097 1734 • info@anotherworldadventures.com. Please make an enquiry and we'll send you the full itinerary for each day including meals, activities, travel and accommodation. The group flight arrives in Delhi in the morning and we will then transfer to our hotel. The rest of the day is free to relax and recover from the flight or for individual exploration of Delhi. Rooms in the hotel are usually available from noon. Those who have made their own flight arrangements will join us at the hotel during the day. Bikes will be transported from Delhi to Manali by road ready for your arrival in Manali. *Comfortable Hotel*. This morning we have an early start and transfer to the railway station before boarding the train for a 4 hour journey to Chandigarh. From Chandigarh we will drive to Mandi (approx. 145km/6 hours), arriving in the early evening. *Standard Hotel*. An easier day today with a half day drive to Manali (110 km/3.5-4 hours). We drive through the lush alpine landscape of Himachal Pradesh into the Kullu Valley. Here we meet the mighty Beas River which we follow to the hill resort of Manali (2020m). On arrival we check-into the hotel and after lunch we will collect/build our bikes ready for the following day. There will be a full bike briefing this afternoon. Late afternoon there will be time to visit the 450-year-old Hadimba temple, which is made completely out of wood and has remarkable carvings. The evening is free to explore the local surroundings. Manali is surrounded by beautiful fir and pine forests and there are lovely walks in and around the town. There is also a colourful bazaar famous for its shawls, jewellery and handicrafts. *Standard Hotel*. This morning we get on our bikes for the first time and go on an acclimatisation ride. We cycle down through Manali town, crossing the Beas River and head south to Naggar. Naggar was once the capital of this area and the old castle has now been turned into a hotel. Near the castle is the Nicholas Roerich estate. Roerich was a Russian artist, who married a Bollywood heroine and lived here in Nagar. He travelled extensively through Ladakh and Tibet and many of his beautiful works of art still hang in the gallery here (please note the gallery is closed on Mondays). After a coffee and cake stop at Naggar we cycle back to Manali for lunch.Cycle approx. 54km, time approx. 5-6 hrs, ascent approx. 1100m.The other option for acclimatisation is to cycle through Old Manali on quiet backroads to the Solang Valley (a ski resort in winter). We can take a short walk to the Shiva Temple here before returning to Manali via hot sulphur springs at Vaishisht where we can have lunch. It is then a short easy downhill back to Manali with a short uphill back to the hotel.Cycle approx. 31km, time approx. 4 hrs, ascent approx. 849m, descent approx. 842m. *Standard Hotel*. Today we start our first full day of biking on one of the classic cycle routes in the world. We start climbing right from Manali through the flower-filled valleys and cedar and fir forests, passing through numerous villages. After the last village, called Kothi, we will cycle up lots of hairpin bends which bring us to the Rohalla Falls. We will then ascend into a small valley where we will reach our camp for the night.Cycle approx. 37km, time approx. 6 hrs, ascent approx. 1415m, descent approx. 119m. *Full-service Camping*. Today we cross our first pass. We set off early and leave all habitation behind as the road zig zags higher and higher into the mountains. It is a fairly tough climb and the road near the top of the pass can be muddy especially when wet. We feel as though we are entering a different world as we reach the top of the Rohtang La (3946m). This barren windswept pass, blocked by snow for more than six months of the year, crosses the Pir Pinjal Range and is the gateway to Ladakh. We leave the coniferous forests and lush green pasturelands behind and enter a vivid mountainous desert. Ahead are spectacular views across to the mountains of Lahaul and Spiti. From the top of the pass the road snakes down 900m to the small village of Khoksar, where we stop for lunch. Care must be taken on the downhill as the road is being worked on and is very rough in places. We then cross the Chandra River and have an easy 14km following the beautiful Chandra Valley to our camp at Sissu.Cycle approx. 51km, time approx. 4 hrs, ascent approx. 816m, descent approx. 1086m. *Full-service Camping*. We are now in the beautiful Lahaul Valley surrounded by wonderful snow capped peaks. The road to Tandi is being worked on and is very rough in places as it undulates by the river. At Tandi the rivers of Chandra and Bhaga meet to become the Chandrabhaga, which we have been following. Crossing the river here we climb through Tandi. The scenery is spectacular and the valley narrows as magnificent mountains rise high above us. Continuing up the valley we cycle through Keylong, a small bustling town. Keylong is the capital of Lahaul and is surrounded by three famous monasteries - we can see the rooftops shining in the sun on the surrounding hillsides. From Keylong the road is good as we climb up above the river to Istingri and Gemur before descending to our camp at Jispa. Next to our campsite is a small temple, which was specially built for H.H. the Dalai Lama.Cycle approx. 55km, time approx. 4 hrs, ascent approx. 1028m, descent approx. 758m. *Full-service Camping*. A fairly easy day for acclimatisation as we are now approaching the Great Himalayan Range. We cycle through beautiful green pastureland to Darcha (3358m). From here we cross the river and have a steep zig zag ascent for 8km and then a nice 12km descent to a small lake called Deepak Tal. We can stop by the lake for a tea break and camp is just a further 1.5km at Patseo (3780m). The site of a lone tea house, Patseo used to be the place of an annual fair of the Changpa nomads. In the afternoon we can have a walk into the surrounding hills.Cycle approx. 25km, time approx. 2-3 hrs, ascent approx. 638m, descent approx. 156m. *Full-service Camping*. A hard day crossing the Himalaya to Sarchu, the border between the states of Himachal Pradesh and Jammu, Kashmir and Ladakh. From Patseo we have a gradual climb past large meadows to Zingzingbar, where we start our long ascent to the Baralacha La Pass (4933m). After a couple of hours and 16.5km we stop for a tea break at the only tea tents on the way up the pass. From here it’s another 2 hours and 16km to the top. Just before the top we pass Suraj Kund, an isolated high altitude lake. From here the top is not so far - the climb seems at times to go on forever but the hard work is worth it as the views become increasingly spectacular. Finally we reach the top - we are in the middle of the mighty Indian Himalaya. The word Baralacha means 'a pass with crossroads' and the trails from Zanskar, Ladakh, Spiti and Lahaul come together here. This is the main crossing of the Great Himalayan Range and offers amazing views of the many snow-covered peaks including Barashigri, Chandrabhaga and Mulkila. From the pass the breathing gets easier as we descend on rough road for 30 minutes (5.4km) to lunch at the tea tents at Bharatpur. After lunch the cycling gets easier (although the road is very rough at first) and it’s an easy 1.5 hours and 20km descending past Kiling Serai and on to our camp 6km before the checkpost at Sarchu.Cycle approx. 57km, time approx. 6 hrs, ascent approx. 1211m, descent approx. 587m. *Full-service Camping*. This will be our longest and hardest day of cycling so we will set off early. We start by climbing fairly gently for approximately 32km across the windswept Sarchu Plains past Brandy Nallah and Whisky Nallah to the bottom of the Gata Loops. This is a series of 21 amazing hairpin bends, which we slowly ascend. Take time to stop and look back - the valley behind is full of amazing wind eroded rock formations. At the top of the loops we will have climbed 400m in 9.4km. From a viewpoint at the top of the loops, it’s another 9.5km to the top of our first pass, the Nakli La at 4948m. We then have a nice 4.4km downhill to lunch at a collection of tea tents. After lunch the road winds up for 7.3km to the top of our second pass of the day, the Lachalung La at 5100m. We are now crossing the barren Zanskar Range and we are surrounded by amazing multi-coloured mountains - the purples, greens and browns of the hillsides change shades as clouds are blown across the sky. From the Lachalung La we have one of the most amazing descents of the trip - an easy 17km ride down (on rough road) through an amazing canyon of magnificent rock formations of the Trans Himalaya until we reach our camp a few kilometres before Pang.Cycle approx. 81km, time approx. 8 hrs, ascent approx. 1611m, descent approx. 1157m. *Full-service Camping*. We start slowly with a descent to the tea shops at Pang, followed by an 8km ascent to the Mori Plains (4778m). We are now in Rupshu, the waterless high altitude desert of the Tibetan Plateau. This area is all above 4500m and is home to the hardy Changpas; Tibetan nomads who live in yak hair tents and graze huge flocks of sheep and yaks in this seemingly barren landscape. We now cycle along a great section of flat black top road for 33km to the turn off to Tsokar Lake. From here it is just over 6km on a sandy track to Tsokar Lake where we camp for the night near Pongunagu. Tsokar means 'white lake', and there are white salt deposits ringing the water. Our camp is a few kilometres from the lake but for the energetic there will be time to walk to the lake, which is good for bird watching and you may even spot some 'kiang', the wild asses which roam the surrounding hills.Cycle approx. 51km, time approx. 4 hrs, ascent approx. 592m, descent approx. 280m. *Full-service Camping*. A hard day today as we cross the last pass before Leh, the Taglang La. We leave Tsokar and cycle back to the main road. From here it is 24km to the top of the pass (most of this section is now on a sealed road surface, with only approx. 8km of rough road). The long climb starts gradually and winds ever higher and steeper to the top of the Taglang La (5350m). You should be proud of yourself at the top - you have just cycled to the top of the second highest motorable road pass in India! We are rewarded for all our hard work with wonderful views of both the Himalaya and the Karakorum Mountains. After a rest and photo stop we have a wonderfully long 25km zig zag descent on a good black top section of road to lunch by the river. After lunch it’s an easy 14km ride down to our first real villages since Lahaul. The houses and green fields of barley and potatoes greet us as we pass the villages of Rumtse and Gya before reaching our camp at Lato.Cycle approx. 73km, time approx. 6-7 hrs, ascent approx. 1004m, descent approx. 1556m. *Full-service Camping*. We start early with an easy ride winding down by the Kyamnar River down to Upshi. Here we join the Indus Valley, which we follow all the way into Leh. Passing a large army camp we come to Karu and then the road 'roller coasters' along the Indus to Thikse, where an impressive monastery sits perched on a hilltop. We cycle up to the monastery (2km), which contains a very impressive two-storey statue of the Future Buddha. Back on the road we cycle past the ruins of Shey Palace and the cycling is fairly easy as we come to Choglamsar, home to many Tibetan refugees. There is a final sting in the tail as we leave the Indus and climb into Leh. Tonight we can enjoy the comforts of a hot shower in our hotel in Leh.Cycle approx. 79km, time approx. 6 hrs, ascent approx. 723m, descent approx. 1230m. *Standard Hotel*. For the energetic today there is the challenging ride to the Khardung La, arguably the highest motorable road pass in the world. After the last 10 days we should now be fully acclimatised to the altitude and mountains. We leave Leh early and take a packed lunch. It will take around 6 hours to cycle to the top of the pass. The views are magnificent as we wind our way higher and higher away from Leh. The first 24km of the ride is tarmac and the last 15km is rough road. From the top we are rewarded with close-up views ahead of the Karakorums, while behind us the Ladakh and Zanskar mountains seem to stretch forever. After a photo stop we have a fantastic downhill ride back to Leh - a great reward for all the hard work this morning! For those who do not want to do the whole ride there will be the option to drive to South Pollu and then cycle the final 15km to the top and all the way down. 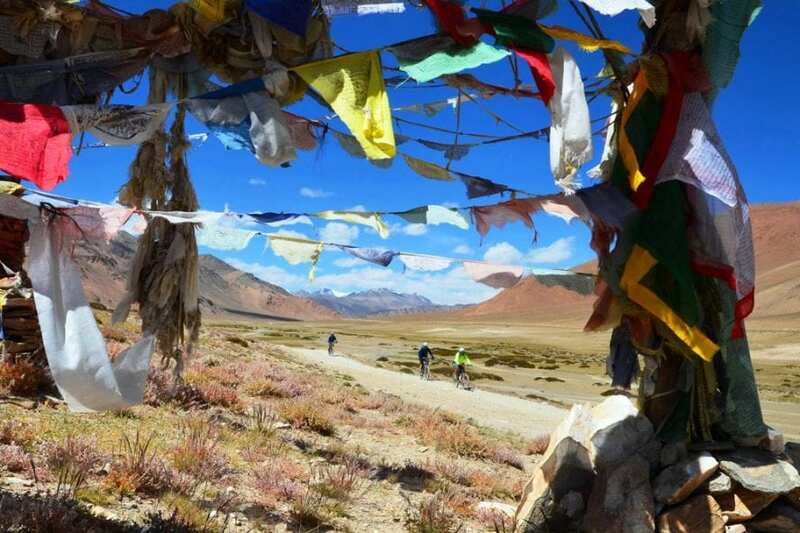 (Please note: If you hold a Chinese, Korean or Taiwanese passport you will not be able to get an Inner Line Permit to do the Khardung Pass trip and you will only be able to cycle from Leh to the check point half way up).Cycle approx. 78km, time approx. 8-10 hrs, ascent approx. 2049m, descent approx. 2049m. *Standard Hotel*. We now have time to relax and do some sightseeing and shopping in Leh. The day is free to explore the back streets and bazaars or maybe do some optional sightseeing around Leh. Set above Leh on the Namgyal Hill, are the ruins of the Old Royal Palace. From here a winding path takes you to the Namgyal Tsemo Monastery. The recently built Japanese Peace Pagoda is also worth exploring, offering stunning views of Leh. *Standard Hotel*. We transfer early in the morning to Leh airport and catch a flight to Delhi. The flight is spectacular as it flies right across the Himalaya. On arrival in Delhi we transfer to our hotel. During the afternoon you are free to relax or explore Delhi. There are plenty of sights in both Old and New Delhi you may want to visit such at the Red Fort, Jamia Mosque, India Gate and Humayun's Tomb. *Comfortable Hotel*. Those on the flight inclusive package will depart for London this morning for the daytime flight back to London; Land Only arrangements will finish after check-out from the hotel.If you have the time and would like to discover more of India, we also offer a Golden Triangle extension after the main tour. All breakfasts, 9 lunches and 8 dinners are included. This adventure can also be booked with UK return flights by the operator – to get prices, dates and availability for the flight option please complete an enquiry form today and mention your flight interest in the message section. Thanks! If you’re looking for a company with experience you can’t beat these guys. This operator started life in February 1974 when two friends got together to provide an overland truck to travel to the Minaret of Jam, deep in the heart of the Hindu Kush, the most inaccessible of the world’s great monuments. For the company, and people who work for them “it’s all about adventure” which is what they were founded on and what they are still about today. Their trips take place all around the world where they help travelers to delve into local traditions, cultures, cuisine, lifestyles – anything that contributes to a country’ unique identity. We love that their groups and guides travel courteously and respectfully, in smaller groups to minimise the impact, to ensure that every holiday is a beneficial experience for everyone involved. Get full details to book this trip. Ask a question about this trip. Add this trip to your bucket list. An off-road tour with amazing landscapes, unparalleled wildlife experiences and authentic local experiences. Endless deserts, hidden ancient cities, and home of the world's most hospitable people, it can only be Iran. We believe in ‘creating better places for people to live in, and better places to visit’ through a responsible approach to travel. Read how you can travel responsibly on your adventure. Our journey began on an ocean adventure sailing across the Atlantic ... find our more and get inspired for your next great trip. You can claim an exciting gift to make your adventure even greater if you book an trip you discovered though Another World Adventures. For updates, news and special offers from Another World pop in your email address below. Copyright © 2019 Another World Adventures. All rights reserved.